The Mammoth Cave Wildlife Museum is a 14,000 square foot museum that opened in 1969, and features more than 1600 stuffed mammals, birds, reptiles, and insects in scenes similar to their natural habitats. Admission to the museum is not required, as this electric penny machine is just inside the gift shop. 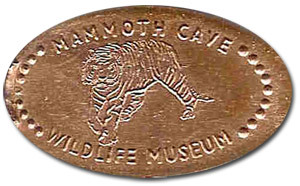 Design: a tiger with "Mammoth Cave" written above and "Wildlife Museum" below. thegillion added Mammoth Cave Wildlife Museum to system.